TOKYO, Japan, August 21, 2013 (ENS) – Japan’s Nuclear Regulation Authority now says a leak of radioactive water from a tank at the damaged Fukushima Daiichi plant Monday is a “serious incident” not just an “anomaly” as it was originally classified on an international scale. On Monday morning, an employee of the plant’s owner/operator Tokyo Electric Power Company on patrol found water leaking from a drain valve of a tank dike on a hillside near reactor No 4 at the power station, which has been shut down and is being decommissioned. The tank is one of about 350 built to store radioactive water believed to contain thousands of trillions of becquerels of radioactive substances. 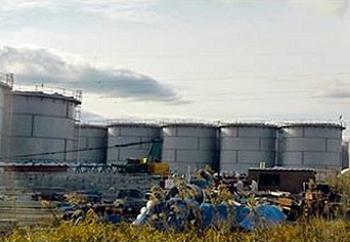 Measurement of the tank’s water level showed that more than 300 tons of contaminated water had leaked. TEPCO, has begun to remove the remaining 700 tons of radioactive water from the tank to investigate how the leak occurred. Monday’s water leak was first classified as a level one incident on the International Nuclear and Radiological Event Scale, but at an emergency meeting today the nuclear regulators agreed they would ask the International Atomic Energy Agency to approve a level three rating on the seven-point scale. The impact of a level three incident on people and environment is exposure in excess of 10 times the statutory annual limit for workers and possible non-lethal radiation burns. “The IAEA views this matter seriously,” the international nuclear agency said today, offering its assistance upon request. The original incident was ranked at the highest level, level seven, and is considered the world’s worst nuclear accident since Chernobyl in 1986. The Fukushima Daiichi power plant was damaged March 11, 2011 by a massive earthquake and tsunami. These events knocked out power to the plant’s pumping system that cooled nuclear fuel rods in the six reactors and spent fuel pools, triggering explosions and meltdowns that spread radioactive material to air, land and sea. Hundreds of thousands of people were evacuated and an exclusion zone 20 kilometers around the shuttered power plant is still in effect. TEPCO told Japanese reporters today that its crews may have failed to find the leak because the tank has no water gauge. The tank is one of about 350 at the plant made without welding from steel plates and bolts to temporarily store waste water from the damaged reactors. Four cases of leaks have been reported so far, according to NHK TV. Members of the regulatory panel plan to inspect the tanks at Fukushima Daiichi on Friday. TEPCO officials say its workers conduct patrols twice a day to check the tanks for possible leaks. On Wednesday, the utility said it will send Vice President Zengo Aizawa, who heads the firm’s nuclear power division, to Fukushima Prefecture to take command of the decommissioning of Fukushima Daiichi. Aizawa apologized for the utility’s continuing to cause so much trouble nearly two and a half years after the accident. He said he will tackle the water leaks as an issue of the highest priority. TEPCO reports Tuesday show that measurements of radioactive tritium in seawater near the power plant in the past 15 days show levels at 4700 becquerels per liter, the highest tritium level since the measurements began. At a news conference today, Shunichi Tanaka, who heads the Nuclear Regulation Authority, demanded an immediate check of all water storage tanks at the damaged power plant. If a leak occurs in one tank, it must be assumed that something similar will occur in others, he warned. Tanaka has instructed onsite NRA inspectors to improve their monitoring of the tanks possible water leaks, admitting that they had sometimes conducted visual checks on rainy days when it would have been impossible to find any leaks from between the tanks’ unwelded joints.